Do you have a child that just loves Dinosaurs? I’ve had two out of three of my boys who just couldn’t get enough dinosaurs in their lives. 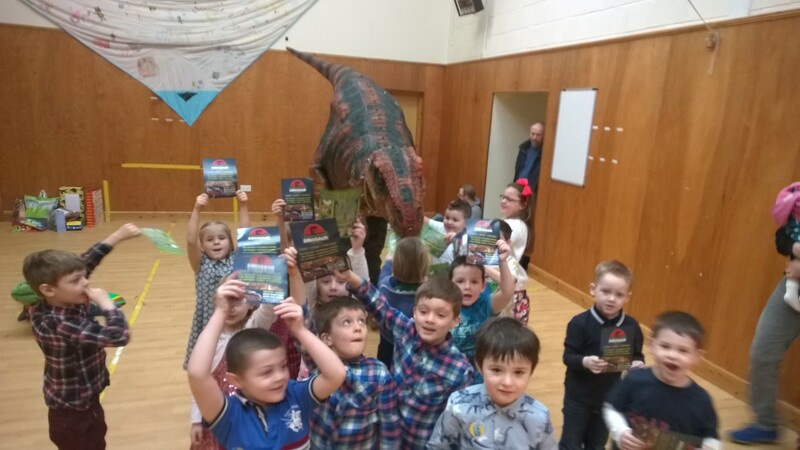 We are now providing a Dinosaur Party Bathgate and Livingston package, which will really make their birthday something to remember. Our giant T-Rex Barnie is awesome and will put smiles on your little ones faces for weeks. So for a Dinosaur Party Bathgate and Livingston call 0131-516-8850 and we’ll get you booked in. Presented by our trained kid entertainer Kevin and operated by Andrew, it’s a really cool party experience. The Dino party lasts 40 minutes. We arrive in a big horse box pulled by our Land Rover, and then it’s time for the party to start rocking. Kevin our animal wrangler will come and introduce himself to all the kids and get them all sitting down and warm them up with some great Dino Patter. Then he’ll get all the children to shout on Barnie to come in. Barnie is epic, and stands 8 feet tall and 12 feet long. He roars, and moves just like a real T-Rex, with blinking eyes, and a huge opening mouth with giant T-Rex teeth. Our Dinosaur Party Bathgate and Livingston is new to the party scene in Scotland, so it’s pretty much guaranteed that no one else will have had the same party. We are looking for ideas for our 7yr old sons birthday party and have seen the dino party. Do you have a set venue? I note that the dino experience is 40 minutes, are there other things to keep the kids entertained and do you provide food? What sort of cost would we be looking at.